The Huh? : Ant-Man: Ant-Man Meme: Anchorman Meme, or Ant-chor-Meme, or just plain Ant-Meme. 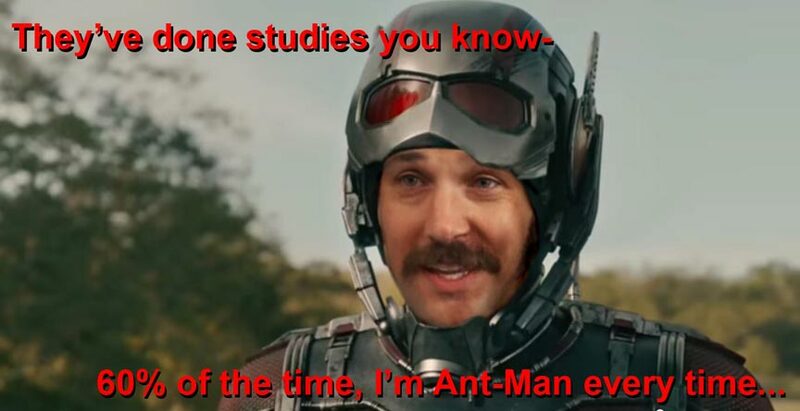 Ant-Man: Ant-Man Meme: Anchorman Meme, or Ant-chor-Meme, or just plain Ant-Meme. With my excitement for Ant-Man reaching exceptional levels, I decided to put my mediocre Photoshop skills to use once again. Yes, it's meme time! I originally wanted to do a Zoolander reference with, "What is this, a hero for ants?!?" Or maybe, "What is this, a meme for ants?!?" But a quick Google search proved that many others had beaten me to it. Click to reverse Pym Particles. It's nothing special, but I wanted people to initially see it really small and actively "use" Pym Particles to see it in actual size. Just a little Anchorman reference to brighten the day.